Hor Mok Pla is one of my fave Thai dishes. 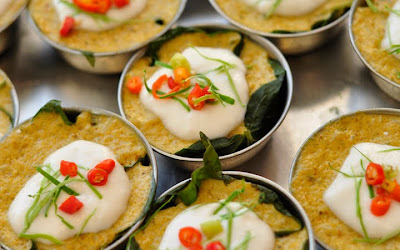 Essentially it is a Curry Fish Custard, steamed in banana leaves, with a sophisticated flavor profile: spicy, rich with coconut cream and citrus notes from the kaffir lime leaf. There is much regional debate about its origins, with Cambodia and Malaysia also making a claim, but the Indian, Portuguese and Malaysian culinary influences are undeniable.